Gone are the days when people would enjoy the thrill of stand-up paddling in an ocean. Those who live inland can enjoy this sport in a river or lake, all year round. Of course, The best way to get the most out of such an experience is to ensure you have the right equipment. This means investing in the best SUP for lakes. Here are a few high rated models that you should consider. Whether you are an experienced surfer or a newbie, you can rest assured that your money will be well spent if you purchase the Wavestorm SUP Board. Having been in business for more than ten years, Wavestorm is a brand that has made in the surfing industry. 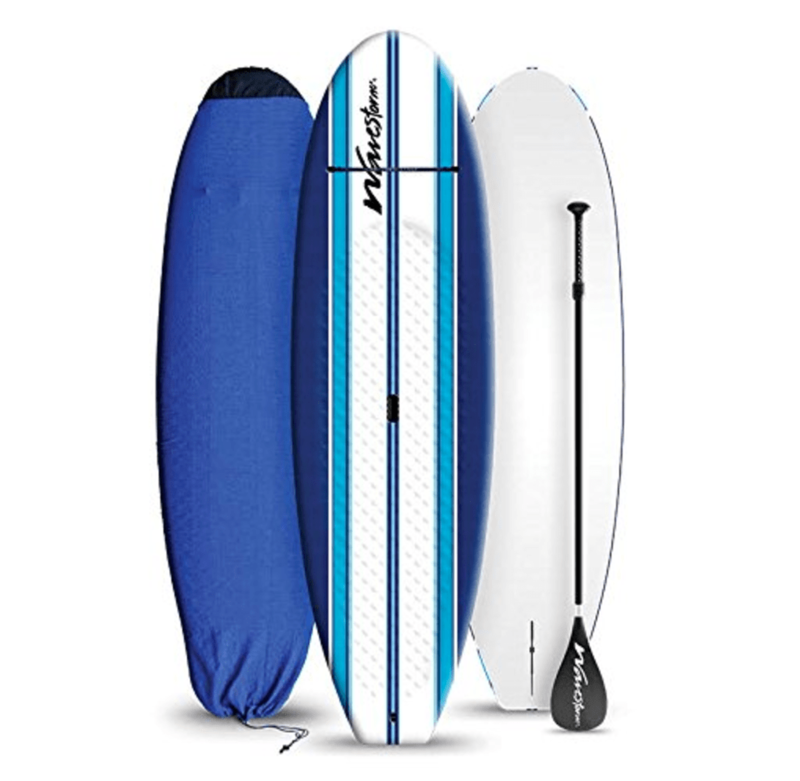 The biggest advantage of the Wavestorm SUP is that it is constructed using expanded polyestrene, which offers more durability compared to fiberglass. You never have to worry about this board going out of shape, especially since this material is reinforced with 3 marine-ply stringers. It will show some cosmetic bruising after months of bumping into rocks, but that’s as much damage it will have. The soft-top construction is a welcome feature as parents no longer have to worry about their kids breaking teeth after a fall. It is soft on the elbows, knees, feet and tailbone. At only 25 pounds and with a carrying handle, transporting this SUP is pretty easy. Another notable feature is that the Wavestorm 9’6” has a leash to strap around the ankle for safety purposes. It also comes with a plastic fin and a single fin box. There is a storage strap that you can use for tying down your bag that’s filled with essential gear or a life jacket. 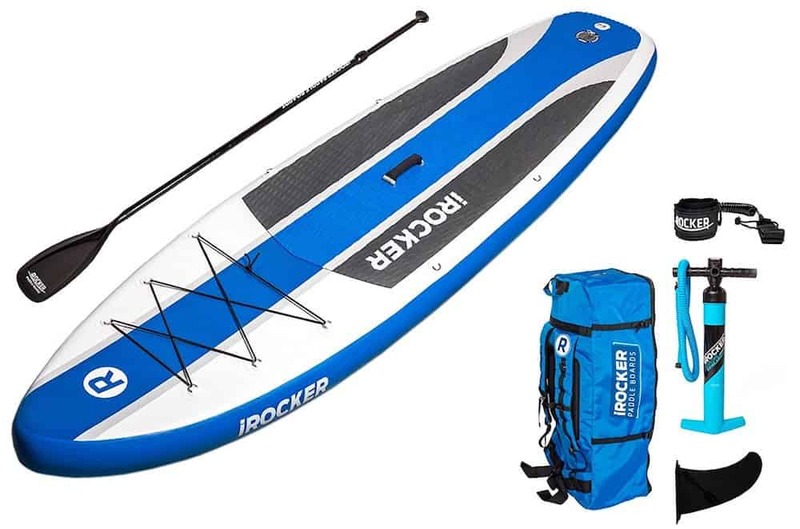 The 10’6” Cruiser is the latest addition to the paddle board family by the iRocker and will prove reliable out at the lake. It is made from a triple layer, military-grade, drop stitch material. It’s as tough as it sounds and won’t even get a scratch. The SUP comes with a 33-inch wide tail, which provides added stability on the water. You have the option of purchasing it with a Kayak Bundle, which includes a kayak blade and an attachable kayak seat. Both of these can be used with any iRocker paddle board. It is offered with a dual action pump for labor-saving inflation. Setting up this paddle board is easy and only takes about 5-7 minutes. Deflation after use is easier as all you have to do is open the valve then push a little pin in. While it doesn’t have a built-in carrying handle, it has something better. The iRocker Backpack allows for easy storage and transportation. The iRocker Cruiser 10’6” has a maximum weight capacity of 250lbs, but leaves heavier riders feeling pretty stable. It features a tri fin setup, thus allowing for increased tracking capabilities. This is something that beginners will find useful. If you can afford to spend more money on your SUP board for lake, the Tower Adventurer 9’10” will prove a worthy investment. It is made using military-grade PVC material and reinforced with drop-stitch construction. As such, you never have to worry about cracks and dings when you hot rocks or corals. Two fins on the sides make surfing in rivers or lakes quite easy as they improve tracking. 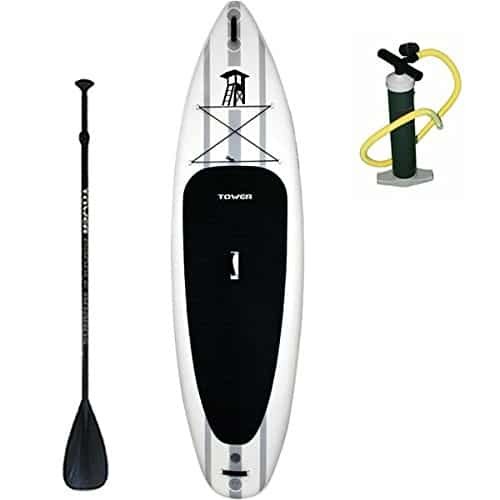 The paddle board is extremely rigid when fully inflated and the 6” thickness allows it to float higher than most SUPs.It can be inflated up to 15 psi, but will still be ready for use at 10 psi. The increased weight limit of 350lbs is what makes it stand out from the other models on this list. Diamond grooving on the deck offers much needed comfort and added security. The 3-piece adjustable aluminum paddle features attached D-rings that make it lighter and more stable than one would expect. The provided pump is quite effective at inflating this board while the handle in the center makes carrying easy. Available in several sizes and the most expensive on this list, there are many things that make the Naish Nalu GS 2015 model a great SUP for the lake. It is designed for versatile paddlers who love paddling in flat water as well as in small and medium-sized waves. The 10’6” version is a great option for lighter paddlers while the 11’4” and 11’6” are ideal for heavier individuals. The core of the paddle board is made using EPS foam while the standing area and stringer are both made of wood. The high grip deck has diamond grooves that provide added comfort and security. Full rails on the sides allow for increased safety. The single concave nose, V-tail and double concave midsection mean added agility as well as stability. There is also a handle that makes carrying this board easy. Tail rocker for effortless turning. There aren’t obvious downsides to this paddle board. For something that costs more than $1000, we would expect nothing less. Best Stand Up Paddle Board For Lake	Overall rating:	5	out of 5 based on 5	reviews.